Pritzker Prize winner Shigeru Ban has revealed the first interior renderings for a residential tower that would become the world’s tallest hybrid timber structure upon completion. The Terrace House will deliver 20 units, each equipped with smart home technologies, and museum-quality glazing that will provide temperature control and UV protection for art collections. The units will also have fully-integrated air conditioning and heating systems, as well as in-floor radiant heating and cooling that will extend to enclosed balconies. Kitchens will feature polished chrome and stainless-steel fittings, custom cabinetry, and white marble countertops. Meanwhile, bathrooms have been designed with white Corian countertops, large windows, floor-to-ceiling sliding glass doors using modern track systems, and Thassos marble floors. Bedrooms are going to be finished with custom Ban-designed millwork, walk-in closets and spa-inspired en-suite bathrooms. All of the 20 units will have ceiling heights up to 27 ft. and panoramic windows. Tenants will enjoy views of the city skyline, mountains and the inlet from terraces attached to their living rooms, bedrooms and bathrooms. These terraces are designed with ambient cove lighting and porcelain tiles that complement the interior white oak wood flooring. Landscaping of each terrace will be completed by award-winning landscape architect Cornelia Oberlander. She will also be responsible for the landscaping of the building’s common spaces. 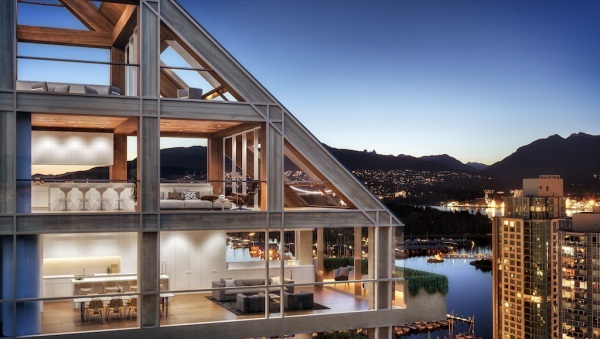 For the construction of these residences, builders will use Douglas Fir timber that has been harvested from sustainably managed forests in the Kootenay region, British Columbia. The developer of the project is Vancouver-based PortLiving.